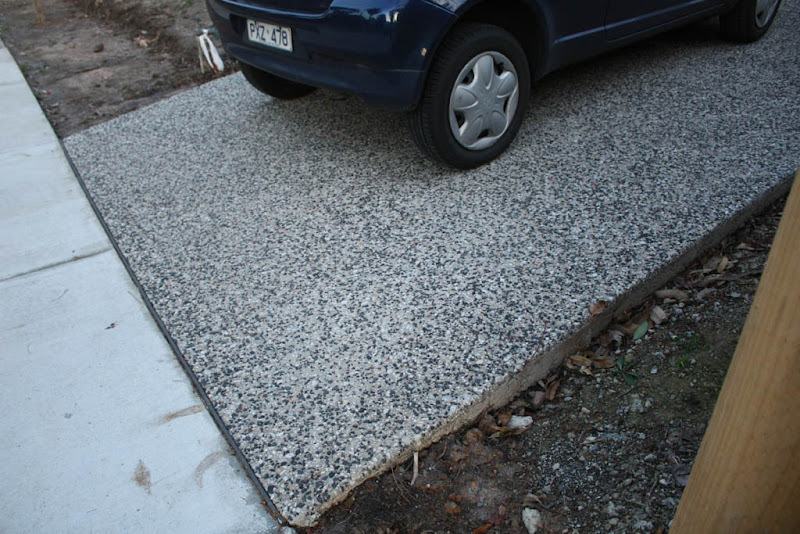 So we think we've picked a concreter to do the driveway and crossover, and he suggested a house in Blackburn we could check out, that was done recently in exposed aggregate. Not really what we're after with the light base colour- probably want something dark in a charcoal.. like these? This is called "Moon Dance", whatever that means. And this one is "Dromana". Both these just random pics found from google images, but if we email them to our concreter, hopefully he can suggest an aggregate with similar mix/finish to these. Of course, these aggregates have a pretty rough surface - not a good playing surface for kids to fall on! Also got a call from the stair sander guy to confirm he's meeting us on site Friday morning after we inspect the house, to give us a quote on sanding & staining the stairs and to see what stain colours are available. Haven't heard from our SS yet to reconfirm times, but will call him tomorrow to check our appointment is still on! Week One review - the good, the bad, the ugly! DAY 269 - HOUSE HANDOVER DAY! Day 262... PCI!! PCI PCI PCI!!! Day 261: PCI date confirmed!